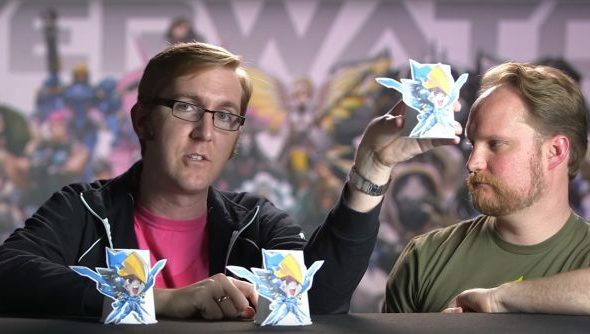 The latest developer video for Overwatch is out, but Jeff Kaplan and his fabulous will-he-, won’t-he-have-a-beard minigame have been replaced by some cups, chibi Pharah stickers and two network programmers to explain how the game’s netcode works. It just about manages to combo being interesting, informative and announce exciting new things – well if the idea of better servers and improved shootybangs excite you. They excite me, is what I’m saying. Get the lowdown on the gameplay side with our Overwatch character list. I’ll let the experts – lead engineer Tim Ford and senior engineer Philip Orwig – take it from here. Currently the netcode basically always favours the shooter in laggy or otherwise non-optimal situations. The exception to this is various special abilities, and an upcoming patch is going to increase how many of these favour the ‘defender’ when they’re activated before its reflected on your attacker’s screen and they fire. This should mean less being shot round corners when you know you dashed/grapple hook’d/otherwise moved. Also in an upcoming patch, general improvements will be made to all sorts of systems that should mean those with good internet connections suffer less problems. Obviously, this is an ongoing process, and I’d expect this to keep improving throughout the game’s lifecycle as more efficient methods are developed and implemented. Higher tickrate servers will be available in an upcoming patch for custom games only – i.e. for competitive and competitive-practice play. For the uninitiated, this basically means that all the different states a character can be in – what a player sees on their screen, what the server has stored and how another player sees the first – are all closer together in time, with less predictions and assumptions being made by the tech. That last is the only place I really take issue. Obviously, it would be preferable if all players could play on the highest quality servers. There’s costs associated with that, 60 ticks not being cheap, so I understand the decision. However, what it will lead to is a natural difference between ‘pro’ matches played between scrimming clans or in high-level tournaments, and the top of ranked matchmaking. What I’d hope for is that Blizzard can enable this technology in the Overwatch ranked mode that is on the way, so all players who are interested in competitive play can take advantage of it, and it doesn’t turn into a two-tier system playing with different advantages. All of this was promised for the next patch, which seems like it will be a big one. There’s less than a month until open beta, which means not long now until we’re all done playing. Another balance pass is certainly on the cards, plus the introduction of ranked if Blizzard is to stay on plan. More skins too, probably another map – plus all these changes. They’ll want to get as much stuff in as possible to take the brunt of a million players on open day. We’ll let you know what happens next.